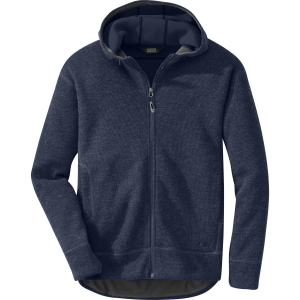 Plush, good looking, comfortable, warm, and windproof. Price Paid: I don't remember exact price. I've had it for over a decade. 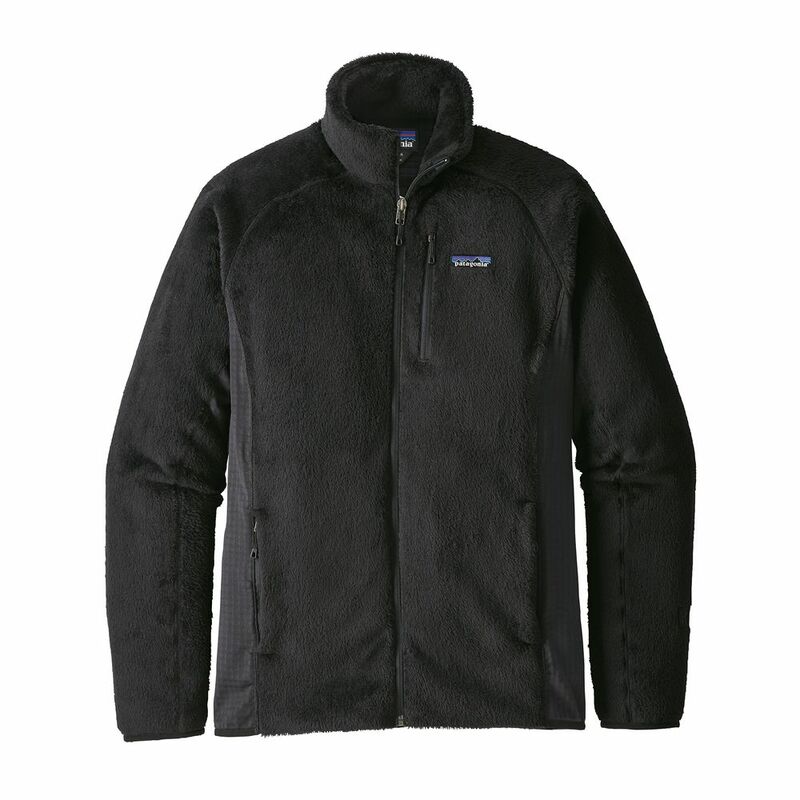 Plush, good looking, comfortable, warm, and windproof. What more could you want in a fleece jacket? I've had my R4 for about 12 years. It has been put through the ringer. It is in every way still as plush, warm, and durable as the day I got it. It is inherently a good looking jacket. Perfect for wearing around town on cold days. I do not always take it on backpacking trips. It does not pack or compress well and it takes up considerable volume in a pack. But in the deepest winter when I know it's going to be constantly cold, the R4 makes the trip. I solve the packability problem by WEARING it. 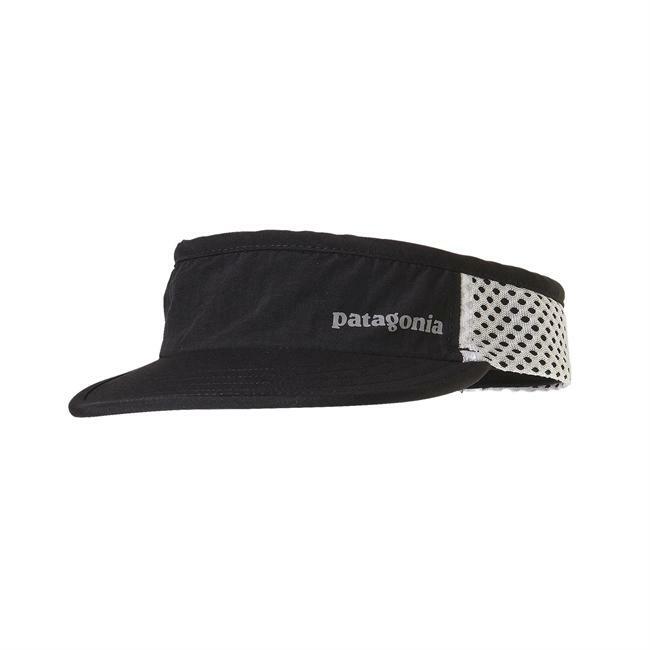 Other reviewers have stated that it is too warm to wear while hiking. For most of the year I would agree, but for near freezing temps or below I think it is ideal. For one thing, it is easy to vent. The zippered hand pockets are lined with a mesh material and when the pockets are unzipped a lot of venting can take place through the pockets. Sometimes I just unzip the main front zipper. The windproof membrane makes the R4 comfortable as an outer layer when less active around camp. It is also a fantastic mid layer under a shell. While I have other coats that I would rate as warmer, such as down parkas, etc., I can't think of any jacket that so noticeably keeps my arms warm. I notice the warmth in my upper arms and pit area almost every time I wear it. The elastic in the cuffs helps to keep the draft out. One modification I made was to replace the cinch cord and barrel lock at the bottom hem. I dislike the barrel lock and excess shock cord on my right side where it can snag on a pistol. The barrel lock in particular can be dangerous if it gets into a holster. So, I took the jacket to an alteration shop and had elastic put into the bottom hem. I ended up liking the fit even better than original as it snugs up around my hips all the time. I have been impressed over the years with the R4. So much so in fact that I have begun looking for a replacement. 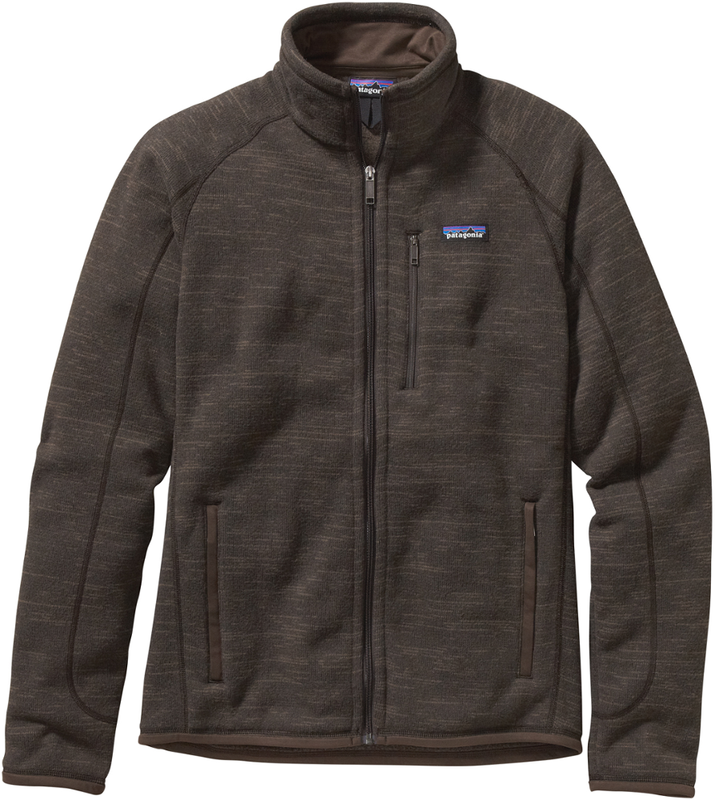 I keep waiting for Patagonia to change the colors with the new year. My jacket is a cool, light sage green. I'm hoping they come out with something similar again. Last year at Christmas I gave both my sons an R4 (one charcoal gray, one black, still not my color). They both love the jackets and both have worn them as their first choice ever since. Dear old Dad finally got something right. I used to wear this jacket all the time around town. It was a plush, attractive garment. I've had it long enough now that it shows some battle scars. It has a few small burned spots from campfire embers which in no way affect the performance. While it's no longer my go-to every day jacket, it can still get the job done. I carry a small bag in my vehicle which has this R4 and a Gore-Tex rain jacket. They live in my car all the time and stand at the ready for the unexpected dip in temp, or rain, or both. 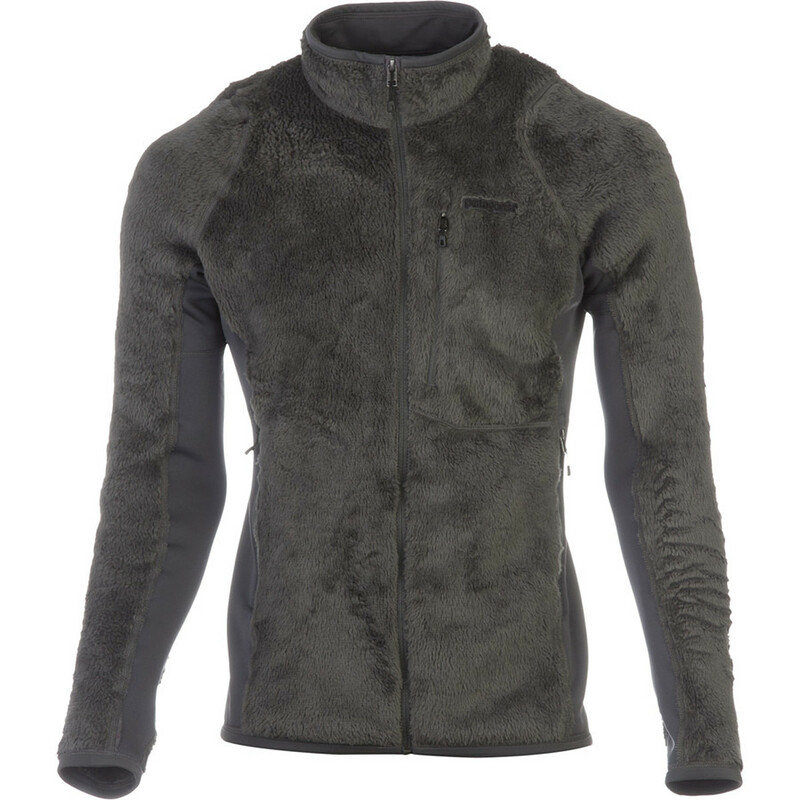 Rock solid windproof and waterproof enough to take on winter, don't let this fleece fool you by its lightweight plush design! 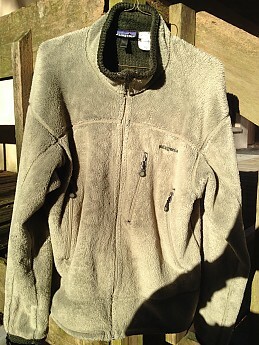 I have used a North Face Denali for years but wanted something warm and windproof. Never did I expect to find something even better! Bought this newest R4 version in blue on Ebay for $120. Not only is this warm/windproof it holds up to 0 degrees when you properly layer it. I find that it is true to size and allows decent layering underneath without being too bulky and still plenty of room. 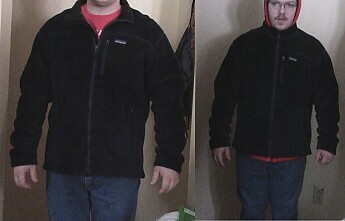 I was worried that the fuzzy fleece exterior would soak up snow/rain and I would have to put either a hard shell or a windbreaker over it. After its first snowstorm I was amazed at how well the Polartec Wind Pro worked. I did have an Under Armour hoodie underneath and I was toasty! I use a Duluth Shoremans hat to cover my head. I go to college in Upstate N.Y. were it can be windy and wet. The Denali isn't windproof but it's water resistant to a point. The R4 fills that gap as an everyday winter coat. I wouldn't recommend it to wear it above 40 degrees due to how warm it is, unless it's really windy. Just don't let your girl friend or wife get a hold of it. You might have to buy another one for her like I did. The only issue I have is that it doesn't have elasticized cuffs to keep wind out and it doesn't have an adjustable waist cord. It does pack well into a backpack, still bulky but not bad. What would make it even better? Add a hood to it, Patagonia! Moving onto water resistance. My girlfriend had a NF Oso Hoodie (older style without the nylon hood) and that's when we tested the R4's true capability for water resistance. This is probably the worst cast scenario wearing a fleece. 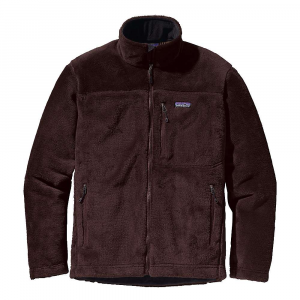 I had a Duluth Shoremans hoodie that's like the Denali but windproof and waterproof. She had her Oso hoodie and when we were coming out of class to go back to our car is when we realized it was pouring rain. I wasn't worried until she said that she will wait it out. She told me from past experience that her jacket wouldn't stand a chance in that heavy of rain. I took the R4 from my backpack and told her to throw it over her Oso Hoodie to see if it would keep her that much drier. She did look at me funny but went along with it. We made the long trek back to the car and she was still dry! She couldn't believe it! Granted the outer portion of the R4 and the Oso hood were soaked, but the R4 was still dry inside! Now I wouldn't use this as a replacement rain jacket as it doesn't breathe nor does it have a hood, but in a pinch it does the job. In the end if you're looking for a rock solid light jacket for winter that is windproof I would strongly take a look at this. Even standing around in 20 degrees with a hoodie underneath it's still very warm! It's best to hunt hard on Ebay or any discount site to get the best deal. Being in college I am finding that the wear to the shoulders is minimal if at all. Perfect replacement for the Denali unless it's above 40 degrees with little to no wind. My girlfriend got one for Christmas, again $150 eBay, and loves it! Thanks for the review, Chris. I hope you'll keep us posted on how this works as an outdoor layer. Your welcome! I will do a update at the end of winter since I just got this back in September. We'll look forward to it. Enjoy winter outside! 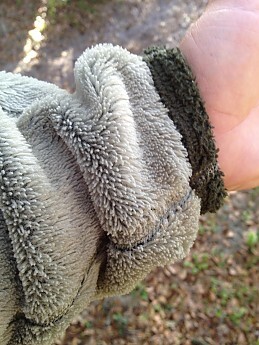 I never hit the trail without this fleece. If you're looking for a bomb-proof insulating layer for those cold nights at camp, then this is what you're looking for. I cannot recommend it for use while hiking; personally, I get quite hot and sweaty while exercising, so I don't wear too much more than a base layer and a shell while hiking anyway. The pros FAR outweigh the cons. I've had my R4 for around a year now, and it truly is a wonderful piece of kit. Yes, it is not very breathable; yes, it is as windproof as windproof gets. For strenuous, above 30F hikes I grab my R2, and for colder hikes, or walking around the city, it's the R4 every time. The winds whipping around Chicago skyscrapers in January are tamed by this jacket. Both the R2 and R4 can be thrown into an x-small sea-to-summit compression sack (6x10?) together, and crammed as small as possible, without any worries. No 5 because the fit is just OK. A bit big in the arms and shoulders is all. Pockets are just where they should be, drawcords hold, and the collar fits my neck great. I am 6'1", 165lbs, and the medium fits me best. I do not miss the lack of drawcord around the neck, nor the lack of velcro at the wrists. For $80 on E-bay, in that deep blue color, I have never found a better deal. Not for hiking, unless for rest stops, in which case you could take something more packable and lighter. This is due to the thick pile and the water-resistant membrane laminate construction. Mine is the early design, which was improved somewhat. Pockets are high enough for a pack belt, chest pocket is slanted. Cuffs do not open so the heat builds up, and there are no pit zips. Hem draw-cords don't work as they should. Pile eventually flattens out under a pack. More of a fishing/photography jacket. This jacket has real potential as a hard-wearing belay type jacket in my opinion. If Patagonia added a hood, made the cut a bit longer at the back and opened the sleeves, then they would be on to a winner. I say this because as a warm-up type jacket it can function as an adjustable insulation layer: the heavier pile on the outside of the membrane only really cranks up the heat when you encapsulate it in a shell. You can then remove the outer shell once you heat up and the jacket itself as you heat up further. Therefore, the versatility it has over a synthetic down belay, which only beats this type of material in weight and compression (drying time and water resistance being a moot point, in my opinion, as it depends on the climate you intend to use it in and the habit of carrying a light hard shell), would accompany its advantages in durability, anti-shoulder strap slide and general coziness. Find a way to bond the seams and it could get even better. 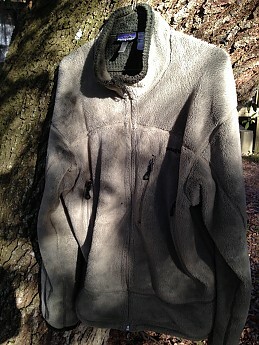 Either wait years for that or look for a company making technical fleeces with hoods. As far as I know only Mammut, a company with hardly the widest distribution in the UK (USA? ), are making anything resembling the above. NB: I went up a size for comfort and layering, when I originally purchased this. I received the R4 as a gift. I have hiked with it on numerous occasions as well as used it as my primary winter coat. It works wonders for both. It is very durable and after going camping recently I washed it to get the campfire smell out. You can tell a lot about quality by how something comes out in the wash. I just line dried the jacket. The only complaint I would have is the ability for this jacket to dry. Being that it has the wind block membrane it takes a while for it to dry completely. I was used to the Polartec windbloc fleece-The Polartec product dried very fast but was not as warm and not as windproof as the R4 Patagonia. Hiking through areas with rock walls with water falling and water fall areas in general is probably not the best place to use this jacket and would recommend using a shell with it, even if it is a low cost parka. Overall the jacket is great and cannot wait until I can wear it again when it gets cooler. This jacket is very warm and toasty-after a brisk hike in 30-40 degree weather I found myself almost taking it off, but it's a great jacket. The pocket placements are great as well and the chest pocket works well for my Garmin ETrex GPS! This is a very warm and super comfy jacket. It is the perfect jacket for just kickin' it around town! I don't hike or pack with this jacket, it's too hot for hiking, unless it's freakin' really cold out, and doesn't pack down very small. The jacket is worth the cash! Perfect multi-use jacket. 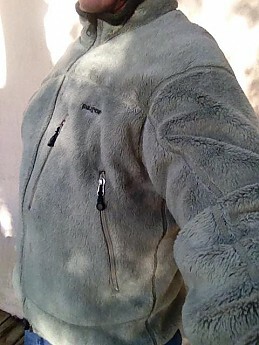 I have found no other fleece that is comparable to this one and I have done quite a bit of shopping around. Medium fits me great being 5'9" and about 165. I disagree with the previous review. This is the coziest, most comfortable jacket I've ever worn. I'm a slim 6' 5" and the XL fits me perfectly. I've been out all day in 35 degree weather with 25 mph North winds, and this jacket kept my core warm and toasty. It's just a bit stretchy, completely windproof, but very breathable -- never clammy like my old Windstopper fleece I replaced this with. The quality and detailing are what I've come to expect from Patagonia. I've been looking for a windproof jacket with decent insulating qualities for quite some time. I looked at every soft shell on the market, then tried out a Marmot Gravity soft shell, but returned it due to the boxy fit and lack of insulation. The R4 is exactly what I was looking for. I probably wouldn't have coughed up $215 for one, but I didn't have to. I'm an extremely happy customer. To the previous reviewer -- Patagonia does guarantee everything they sell. If it had a defect or didn't fit right, they'd take it back. This is not a serious piece of outdoor gear. The drawstring on the bottom does not hold any tension meaning it doesn't seal effectively, and does not keep me warm. Additionally, the sleeves are not tight enough to keep out the cold, and there's no drawstring on the neck. All together, this adds up to a very expensive jacket that does not keep me warm. It might serve me well to go to a cafe but I don't drink coffee so I'm SOL. I bought this on sale (now I know why) after I lost my Mountain Hardwear Link Jacket. The MH was better in every way, and cheaper. I love this jacket! I use it daily, I wear the medium and I'm 6 ft and it seems to fit me great. 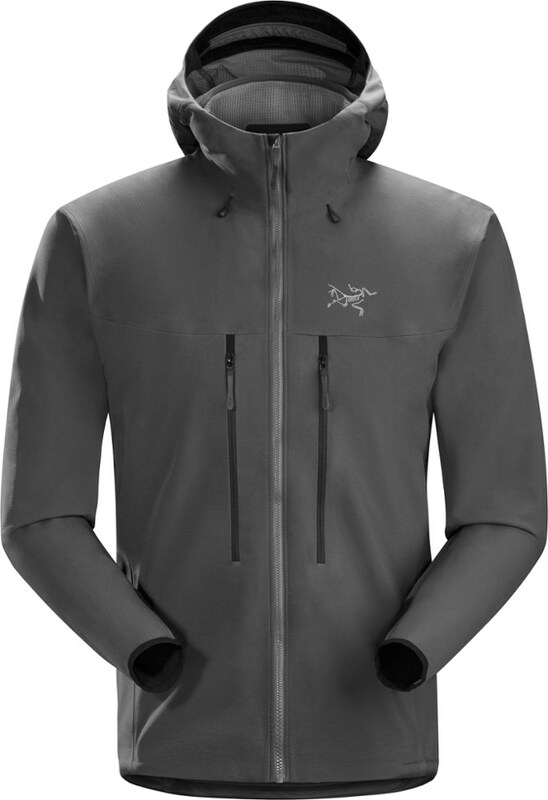 The concept, Thermal Pro fleece in a windproof jacket, is great. However, at 6'2" tall, it barely comes down to the top of my pants, and the sleeves are equally as short. The same is true of the R2 Body Rug and the R2: too short in the torso and the sleeves. Patagonia should make some TALL stuff. I ended up returning the R2, R2 Rug, and the R4. I really wanted them to work because I could tell the fabric was going to do what it was supposed to do, breathe and heat. The EMS Quadzilla works better with High Loft Thermal Pro, and sections of Power Stretch, for a bit less (retail) price. It is long enough and the stretch sections vent well. It is not windproof. The Patagonia Men's R4 Jacket is not available from the stores we monitor. It was last seen February 24, 2018	at Moosejaw.